​Ashes to Ashes is a demo project that presents 3Lateral Digital Doubles pipeline and results for in-game and game cinematic solutions, facial animation solutions from Cubic Motion and casting, writing, directing and capturing services by SIDE. Final result is an articulated and animated model built to work optimally on Playstation 4, XBox One and PC that delivers believable and engaging performance. Project presents 3Lateral pipeline from scan data acquisition, FACS direction, head model and texture creation, processing scans to animate-able blendshapes, modeling of contextual blendshapes, production of dynamic high resolution secondary and tertiary details through 3Lateral dense correspondence pipeline and finally a rig suitable for use in game engines. Highlight of the 3Lateral facial rig is certainly it's embedded solver Rig Logic which handles the animation of joints, blendshapes and animated maps in a way that makes the rig intuitive and fun to animate manually and very robust when used with solvers based on motion capture data. Rig Logic also allows reusing the animation between different faces regardless of their proportions and provides significant and lossless animation data compression that may range from 10 to over 150 times compressed data without any loss in fidelity. 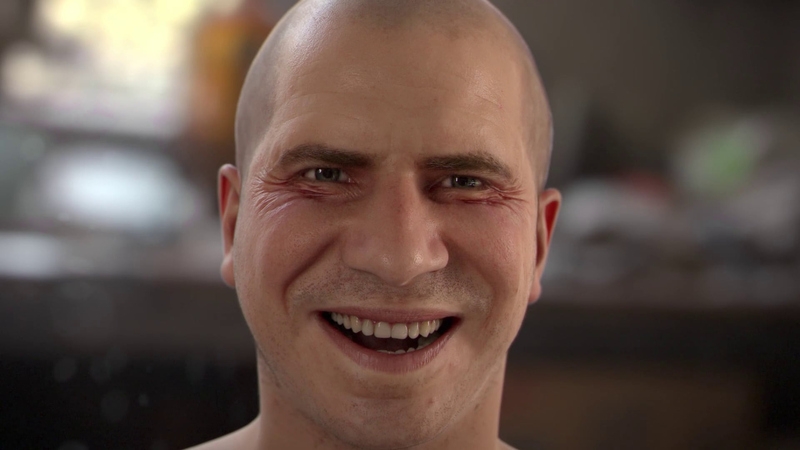 Facial rig has an LOD system for seamless switching between high and low fidelity data allowing game developers to further control the expense of the rig at runtime. With this project we're presenting a "happy medium" asset that balances well between hardware requirements and fidelity. We'd also like to thank SIDE and Cubic Motion for another successful collaboration between our companies.